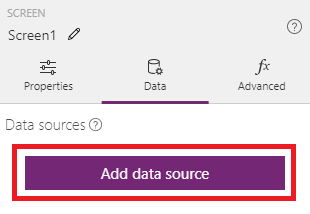 Connect to SQL Server, in either Azure or an on-premises database, so that you can display information from it in PowerApps. Sign up for PowerApps, and then sign in by providing the same credentials that you used to sign up. If you don't have this information, ask the administrator of the database that you want to use. 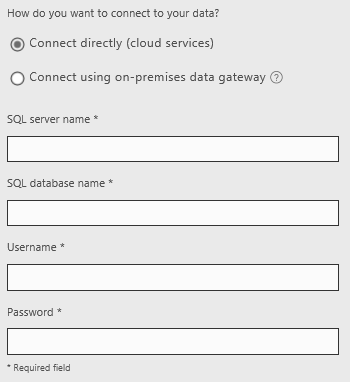 For an on-premises database, identify a data gateway that was shared with you (or create one). 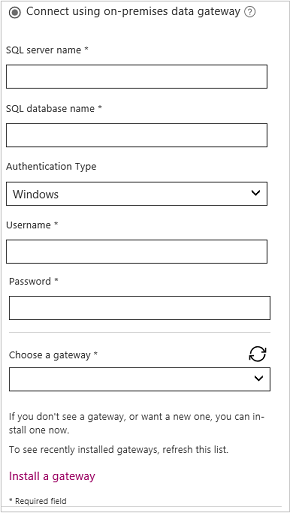 Gateways and on-premises connections can only be created and used in the user's default environment. In PowerApps Studio, click or tap New on the File menu (along the left edge). Under Start with your data, click or tap the right arrow at the end of the row of connectors. If you already have a connection to the database that you want to use, click or tap it, and then skip to step 7 in this procedure. 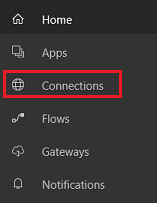 Click or tap New connection, and then click or tap SQL Server. 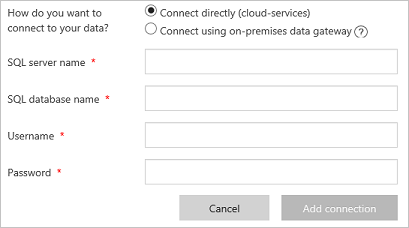 Specify Connect directly (cloud services), and then type or paste the server name, the database name, the user name, and the password for the database that you want to use. 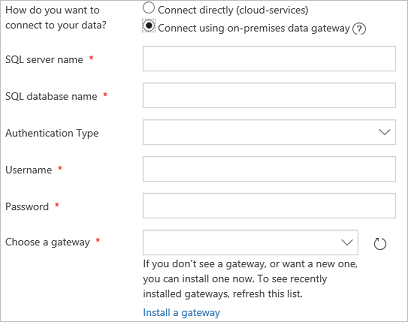 Specify Connect using on-premises data gateway, type or paste the server name, the database name, the user name, and the password for the database that you want to use, and specify the authentication type and the gateway. 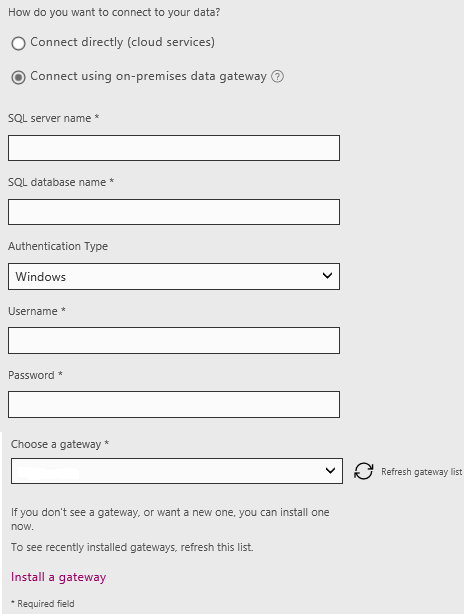 If you don't have a gateway, install one, and then click or tap Refresh gateway list. Click or tap an option under Choose a dataset, click or tap an option under Choose a table, and then click or tap Connect. PowerApps creates an app that shows data on three screens. Heuristics suggest what kind of data to show, but you might need to customize the UI to suit your needs. Customize the app by using techniques that are similar to those that Create an app from Excel describes, starting with changing the app layout. Sign in to powerapps.com with the same account that you used to sign up for PowerApps. 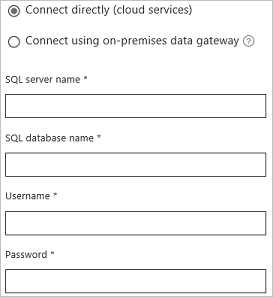 In the upper-right corner, click or tap New connection, and then click or tap SQL Server. If you don't have a gateway, install one, and then click or tap the clockwise icon to refresh the list. Click or tap Create to create the connection. Create an app by using techniques that are similar to those that Create an app from scratch describes. In PowerApps Studio, open the app that you want to update. Click or tap Data sources on the View tab of the ribbon. In the right-hand pane, click or tap Add a data source. Click or tap New connection, click or tap SQL Server, and then click or tap Connect. If you don't have a gateway, install one, and then click or tap the circular icon to refresh the list. Under Choose a dataset, click or tap an option. Under Choose a table, select one or more checkboxes, and then click or tap Connect. Learn how to show data from a data source. Learn how to view details and create or update records. See other types of data sources to which you can connect. Understand tables and records with tabular data sources.